The OLS-85 inspection-ready optical light source is the ideal partner to the SmartClass Fiber OLP-85 and OLP-85P to perform automatic loss test. 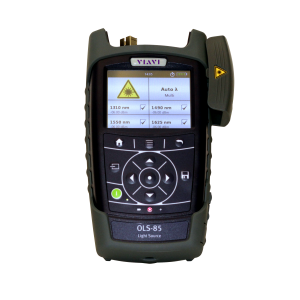 The SmartClass™ Fiber OLS-85 handheld light source is a professional, versatile, and compact instrument used for fiber-optic network qualification and certification. Its specific wavelength combinations make it optimal for link loss testing and long-haul, metro, and access telecommunication network characterization, as well as data center and local area network testing.